Most of the analysis in this report is based on telephone interviews conducted Feb. 14-23, 2014 among a national sample of 1,821 adults, 18 years of age or older, living in all 50 U.S. states and the District of Columbia, including an oversample of young adults ages 18 to 33 (481 respondents were interviewed on a landline telephone, and 1,340 were interviewed on a cell phone, including 786 who had no landline telephone). The survey was conducted by interviewers at Princeton Data Source under the direction of Princeton Survey Research Associates International. A combination of landline and cell phone random digit dial samples were used. 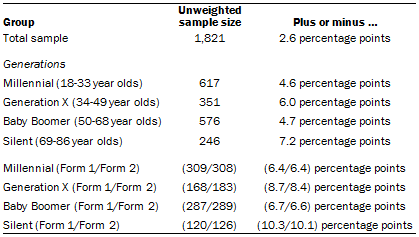 In order to increase the number of 18 to 33 year-old respondents in the sample, additional interviews were conducted with that cohort by screening a separate random digit dial cell sample. The landline and both cell phone samples were provided by Survey Sampling International. Interviews were conducted in English and Spanish. Respondents in the landline sample were selected by randomly asking for the youngest adult male or female who is now at home. Interviews in both cell samples were conducted with the person who answered the phone if that person was an adult 18 years of age or older (main cell sample) or 18-33 (cell phone youth oversample). The combined landline and cell phone sample are weighted using an iterative technique that matches gender, age, education, race, Hispanic origin and nativity and region to parameters from the 2012 Census Bureau’s American Community Survey and population density to parameters from the Decennial Census. 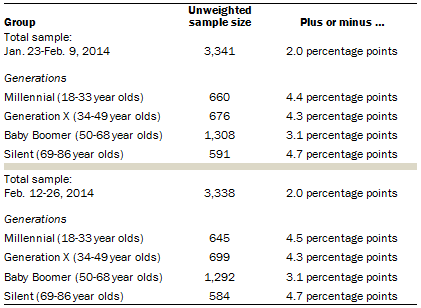 The weights account for the oversample by bringing the proportion of 18-33 year olds in the survey into line with that cohort’s share of the US population. The sample also is weighted to match current patterns of telephone status and relative usage of landline and cell phones (for those with both), based on extrapolations from the 2013 National Health Interview Survey. The weighting procedure also accounts for the fact that respondents with both landline and cell phones have a greater probability of being included in the combined sample and adjusts for household size among respondents with a landline phone. Sampling errors and statistical tests of significance take into account the effect of weighting. In addition to the main survey described above, the report is supplemented with public opinion data from surveys conducted Jan. 23-Feb. 9, 2014 and Feb. 12-26, 2014 among national samples of adults 18 years of age or older living in the continental United States. For the Jan. 23-Feb. 9, 2014 survey, 3,341 total respondents were interviewed; 1,671 respondents were interviewed on a landline telephone, and 1,670 were interviewed on a cell phone, including 875 who had no landline telephone). For the Feb. 12-26, 2014 survey, 3,338 total respondents were interviewed; 1,671 respondents were interviewed on a landline telephone, and 1,667 were interviewed on a cell phone, including 905 who had no landline telephone). The surveys were conducted under the direction of Abt SRBI. A combination of landline and cell phone random digit dial samples were used; both samples were provided by Survey Sampling International. Interviews were conducted in English and Spanish. Respondents in the landline sample were selected by randomly asking for the youngest adult male or female who is now at home. Interviews in the cell sample were conducted with the person who answered the phone, if that person was an adult 18 years of age or older. For detailed information about our survey methodology, see http://people-press.org/methodology/. These two supplemental surveys were weighted to the same parameters as the main survey. Some of the data in the Overview used to define the demographic characteristics of each generation are based on the March 2013 Current Population Survey (CPS). The CPS is collected monthly by the U.S. Census Bureau for the Bureau of Labor Statistics. The CPS is nationally representative of the civilian noninstitutionalized population. Additional documentation on the CPS can be found at https://cps.ipums.org/cps/.